WooHoo!!! It is November 1st which means my month of special Christmas giveaways for 2015 is beginning! I do love this month where I get to give so many fun things away!!! At this point I have 22 giveaways scheduled . . . and may add another one or two! 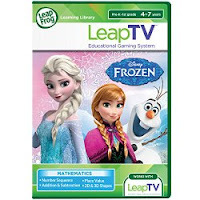 So, today, on November 1st, I'm very happy to say, Amy Pugmire is the winner of LeapTV Frozen game cartridge! (You'll find my review of LeapTV Frozen at this link.) Thank you Amy for reading grandma's cookie jar (please email me your address at lyndagcj@gmail.com by November 8, 2015, so I can send it to you) and thank you LeapFrog for sending it for me to give away! My next giveaway is in two days on November 3, 2015 . . . I'm giving away a really lovely book . . . . 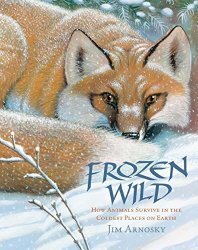 Frozen Wild: How Animals Survive in the Coldest Places on Earth. You'll find my full review and all the specifics for entering this giveaway at the following link. Please let the people you know about this giveaway and enter yourself . . . who knows??? Maybe you will win!! !